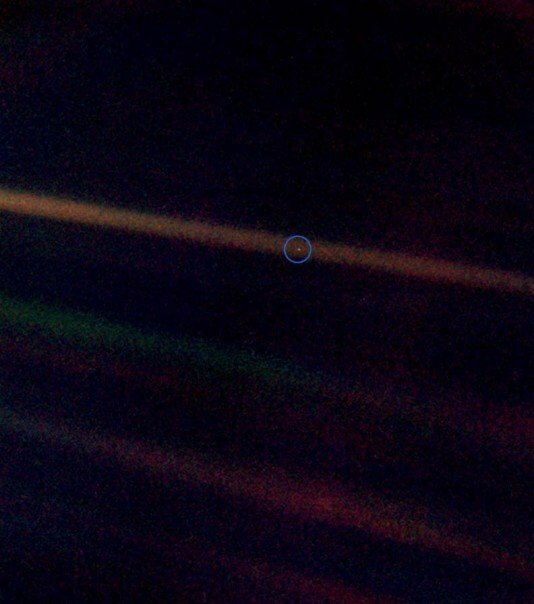 Yet Another Pale Blue Dot Video. And I never get sick of them. There are many out there and I’ve watched a good few of them, read the words many times, I own the book and somehow it never gets old. It’s always cause for pause and for contemplation. Perhaps, that’s the power of fundamental truth? Whatever it is, it’s more than the beautiful words and the genuine message they convey. I “missed” Carl’s birthday, when a new batch of these videos went up as tribute. I suppose I could’ve joined in, but I didn’t get the memo. No matter, many other good folks have it covered ten ways from Sunday. That and I’m utterly horrible with birthdays, I’ve forgotten about my own on several occasions. Of the many Pale Blue Dot videos I have seen, this one is probably the best (hence the post) – complete with narration by Carl, as it should be. “ Look again at that dot. That’s here. That’s home. That’s us. On it everyone you love, everyone you know, everyone you ever heard of, every human being who ever was, lived out their lives. The aggregate of our joy and suffering, thousands of confident religions, ideologies, and economic doctrines, every hunter and forager, every hero and coward, every creator and destroyer of civilization, every king and peasant, every young couple in love, every mother and father, hopeful child, inventor and explorer, every teacher of morals, every corrupt politician, every “superstar,” every “supreme leader,” every saint and sinner in the history of our species lived there–on a mote of dust suspended in a sunbeam. You are missed Dr. Sagan. This entry was posted on Thursday, November 24th, 2011 at 10:47 pm	and posted in Communication, Sanity, Science. You can follow any responses to this entry through the RSS 2.0 feed.